I just wasn’t feeling the love with the embossed leaves sock toes. I couldn’t knit the same lace backwards, but I liked the star toe. Couldn’t get the lace knit frontwards to fit with the toe. Not wild about the colorway with this pattern. Blech. To the frog pond they went. 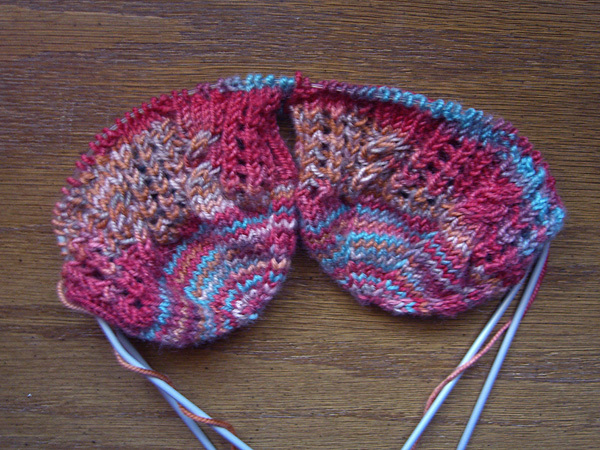 Last night I saw what Alice did with her socks — same pattern, same colorway, toe up. Her yarn looks quite a bit darker and richer than mine. Hand-painted dye lots can be so different! I think Alice’s looks great and I might try again with a different colorway. But not with this colorway. For some reason I’m still not feeling the love there. I have some Lorna’s Laces, though, that might be fun to play with in this pattern. Anyway, I started a new pair of socks. Once again, this is Socks That Rock in Red Rock Canyon. Double circs. Inox Gray US#2. Magic cast-on. Two at a time. The usual. I started with a 6-part pinwheel toe. The stitch pattern is called Tipsy Knitter in the Socks Socks Socks book and Tilting Ladders in Barbara Walker’s Second Treasury of Knitting Patterns. In the picture, I’ve finished 1/2 of the first repeat. In the last part of the repeat, the cable will become a ladder and the ladder will be a cable and they will tilt left. It’s hard to tell from this picture, but the ladders and cables in the first 1/2 of the repeat tilt right. The colors are pooling in strange and interesting ways. The blue, unfortunately, seems to be ending up mostly on the sole side of the socks. I think, though, that with this pattern the pooling is OK. It’s just another tipsy part of the sock. The blue is peeking out on the front side, now, so I have hope. I’ve been working away on the silk/cashmere leaf scarf, also. It’s coming along nicely and is about a foot long. I worked a couple of repeats last night at Tangle knitting night. Alice had a great idea for how to end the last leaf, if I ever get there! I have a feeling this scarf is going to be one of those long-term projects. I can’t work too many repeats before I start to lose concentration and mess up the pattern. I went back to sock knitting while sipping on a glass of wine. (Friends don’t let friends drink and knit lace!) The tipsy knitter socks seemed much more appropriate under those circumstances.